Provides illustrations of the devices throughout with descriptions of how they are used in industry. 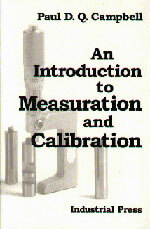 Offers a vast amount of new material that can be applied to virtually any imaginable measurement or calibration task. Measuration Systems. Mechanical Measuring Devices. Squares and Surface Plate Instruments. Gages. Angular Measuring Devices. Electronic Measuring Devices. Optical Measuring Devices. Miscellaneous Measuring Devices. Appendices. Metric/English Conversions, Suggested Reading, Gear Tooth Measurement. Index.